Space Dragons Dragon Boat Racing Team: Human Poker! Long Beach -- this weekend! One of the exciting parts about the upcoming tournament weekend is the chance to once again be united with our sister team from SF, Ripple Effect! 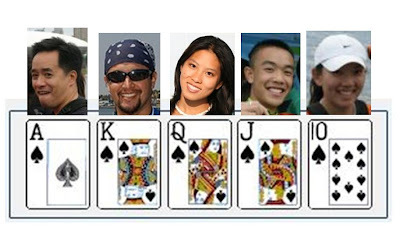 Inspired by Jim's recent Poker success, Tina has planned a Ripple-Space game that will be rolled out tournament weekend to encourage everyone, especially first-year paddlers, to get to meet the sister team they've heard so much about! Each Space Dragon & Ripple Paddler will be given a single playing card on Saturday morning. No trading this card away! Find four other paddlers & form your best possible 5-card Poker hand by Sunday afternoon. Poker hands must include at least 2 Ripples & 2 Space Dragons. No wilds. No 5-of-a-kind hands. General poker rules apply. Jim to serve as judge.